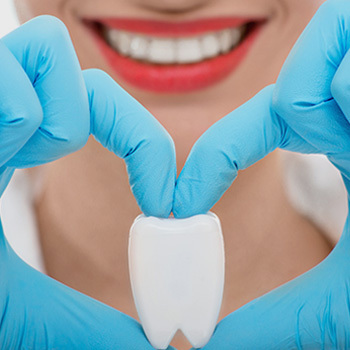 If you're feeling self-conscious due to suffering from missing or broken teeth, a crown or bridge could be the ideal option to restore your mouth's aesthetic appearance and function. 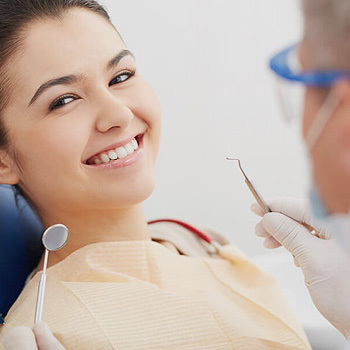 Taree Dental Care provides professional restorative dental services. Dental bridges are used to replace one or more missing teeth. This type of treatment involves attaching an artificial tooth between two crowns on each side of the missing tooth. To attach a bridge normally requires two visits; one to prepare the two teeth for crowns to be fitted, and also to take impressions of the surface area to send to the laboratory for the bridge in metal porcelain or full porcelain to be made. Then two temporary crowns or a temporary bridge is attached. The second appointment is when the temporary restoratives are removed and the permanent bridge is attached and cemented. For a crown or bridge treatment, make an appointment with our friendly team at Taree Dental Care today. Crowns is a dental restoration process, involving fitting a new crown to an existing natural tooth that is severely damaged. The crown encircles the tooth, restoring it to its original form. A crown can also be fitted to the top of implants for a perfect tooth shape restoration. To have a crown fitted generally requires two visits. The first visit involves preparing the tooth to have the crown attached. An impression of the prepared surface is taken and a temporary crown fitted. 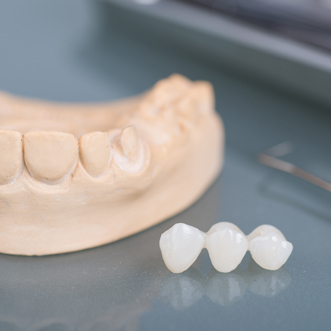 The impression of the prepared tooth surface is then sent to a laboratory, whereupon a crown is hand-made in gold alloy, metal porcelain or full porcelain to suit your teeth. At the second dental appointment, the temporary crown is removed and the new crown is fitted.